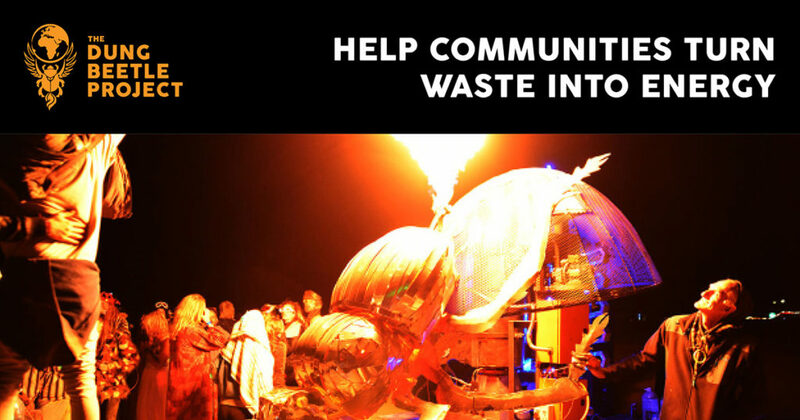 Donate to our Gofundme campaign and help us transform plastic into up cycled fuel with our Dung Beetle. We can’t turn water into wine, but we can turn plastic waste into fuel and make an unforgettable spectacle at the same time! Yes, the Dung Beetle is a machine built to turn single-use plastic rubbish into usable fuels like kerosene, diesel, and gas. So how does this miracle happen? We use a process called pyrolysis, which is just a fancy way of saying we heat it up carefully. The plastic is shredded and then pushed into the reactor chamber, where it is burnt without oxygen. This process does not release any nasty plastic smoke into the sky because the “smoke” is what we condense back into liquid fuels and gas for cooking. If it smokes at all, it’s not working! The Dung Beetle is more than just turning waste into fuel, it’s an instrument to inspire, inform and knock your dancing socks off. The machine is built into a sculptured art piece crafted as an African Dung Beetle pushing the Earth and mounted on a trailer with a stage and ripping sound system for DJs and live music. The fire from the beetle’s behind drawing a crowd who can learn about the process first-hand, then party late into the night with energy from plastic. 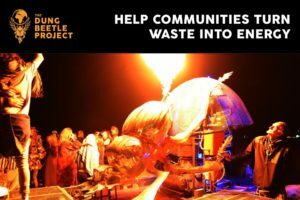 As a traveling art stage, it’s a tool to educate communities about successful science and environmental projects that can change people’s lives, as well as a flaming trigger to spur innovative thinking. Although the beetle’s main benefit is solving our plastic wastage problem and create a new kind of worldwide plastic value chain, our mission is even bigger. From our stage, we will share other environmental solutions that can help our struggling ecosystems, like sustainable agriculture, solar energy and much much more! A smaller design perfect for small community plastic recycling projects is being put together and will be shared open-source so everyone can build their own. We are also designing bigger machines for industry and urban areas and we have plans to hit the road, visiting schools, parks, and cities around southern Africa. Want to get involved? Be A Beetle! By packing art, music, and fun into environmental education we feel this project can make a real difference and quickly drive global uptake. But it will take help. We have rolled out this project with the help of our core team but we need your help to develop our plans, move the Dung Beetle around southern Africa and share the full potential of this fun, fiery and unforgettable technology with communities. Together we can make our world a cleaner, greener place and inspire the innovative minds of the future. We are using this next fundraising capital to develop our prototypes in both CAD and real-world plans, build our website, bring on more workers to help us with research and fabrication. There is so much to get rolling, but we can do it together. Can’t donate? No problem, join our Beetle crew by sending us a flaming mail, and tell us about your skills or interest, or just sign up for our monthly newsletter. The Latest News is Exciting! Due to a huge interest in having completed machines supplied around the world, our team is also developing a business plan for our exciting for-profit offshoot called ScarabTech, which will build gasification systems by employing skilled workers left jobless from the collapse of South Africa’s mining industry. Mail us for details. This entry was posted in Blog, News and tagged Dung beetle recycling, Dung beetle you caring fund, Plastic into diesel, Waste into fuel.